A bet’s a bet, and I’m calling on Mattress Mack to pay off. During my recent TDN podcast with Jim McIngvale I got him to agree to a friendly wager. McIngvale is a huge Houston Astros fan and there is no bigger Red Sox fan than myself. With the American League Championship Series tied at 1-1 at the time, I offered to have my picture taken and printed in the TDN wearing an Astros jersey if Houston won the the ALCS. He asked that it be the jersey of Alex Bregman. If the Red Sox won the series, I wanted McIngvale to name one of his horses in honor of the Red Sox or one of their players. With the Sox having finished off the Astros Thursday night, I am ready to head to the cashier’s window. Mack, don’t worry about looking into researching names. I’ve done it for you. My first choice was Benintendi, for left fielder Andrew Benintendi, who all but saved the series with his dramatic game-ending catch in Game 4. That name is taken. So is Mookie, the given name of the great Mookie Betts. So, I’m going to go for Mookie Bets, one “T,” which should mean we don’t have to get Betts’s permission to name a horse after him and the “Bets” part fits in perfectly considering this is a wagering game. 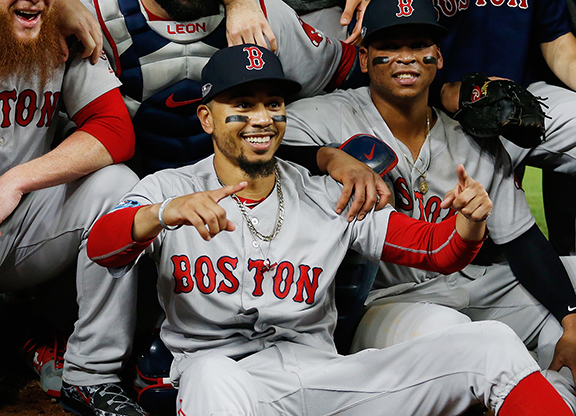 If that doesn’t work, how about MVP Mookie? They’re both available. Sorry, about your ‘Stros, Jim. But it’s time to pay up.